Dr. Tomás Ó Canainn wrote this tune and recorded it with his daughter Nuala to honour and celebrate the twenty-first birthday of their musical friend Johnny McCarthy. Their recording was named Béal na Trá and was issued in 1982 on the Outlet label. In keeping with Tomás' being a piper, the tune on this track is played on the pipes by my good friend from New York, Jerry O'Sullivan. 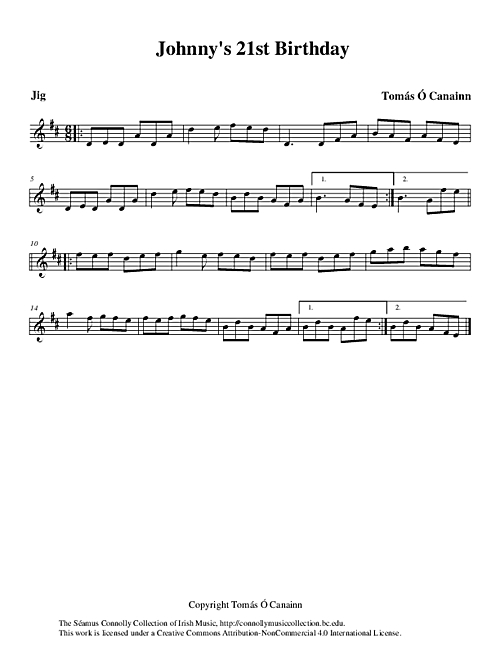 O'Sullivan, Jerry (uilleann pipes) and Ó Canainn, Tomás (composer), “Johnny's 21st Birthday,” The Séamus Connolly Collection of Irish Music, accessed April 20, 2019, https://connollymusiccollection.bc.edu/document/455.